Everything Coastal....: Look at What I Found in Ballard! Look at What I Found in Ballard! I confess... love a great bargain. Also love discovering new places to find treasures - thank you Melissa for introducing me another hidden jewel in Seattle, a new (to me!) 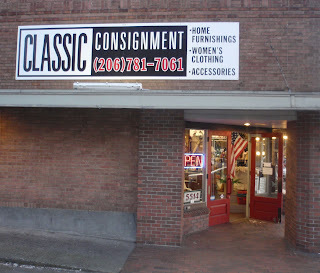 consignment shop in downtown Ballard of all places. I highly recommend "Classic Consigment" on 24th Ave., they have wonderful furniture, accent pieces, china, art, jewelry and a whole lot more. All at very reasonable prices and good quality + the shop owners are welcoming and fun! I carried Vietri Italian Artisan inspired dinnerware in my coastal living retail store in Poulsbo, and one of my biggest regrets is that I didn't buy any for myself! Love the shapes, the colors, the history, the artistry and in all of the painstaking care in the hand painted details. If you have ever seen Vietri, you will know what I am talking about! I found two PERFECT examples of Vietri, while happily searching the shelves at Classic Consignments - almost giddy with excitement! 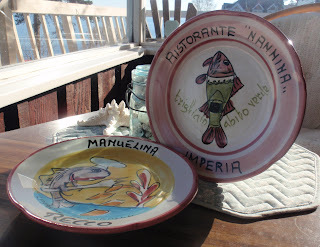 Check out my find - 2 collector pieces from the Ristorante' series - "Mauelina" and "Nannina". Trying to decide if I should keep them or list them on the website in my "Beach Finds" category. What do you think? Off on more adventures this week - stay tuned! Keep them... or at least one of them... they are wonderful! Keep 'em, hang 'em on the wall til you don't notice them anymore...then sell 'em! Hi Caron! Thank you for your kind comments regarding my blog. I, sincerely, appreciate it! I love a good consignment store too! And....garage sales, yard sales, estate sales and the list goes on and on! Very nice blog and shop you have! Stop by again soon! Thanks Patti! Looked up Morrow Beach online, hoping to come up and see your stretch of your coastline after I finally get moved to San Francisco next week. I've nominated you for a Sunshine Award!